After reading this wonderful book I kept wondering, “Why don’t we all live and love like the March family?” It’s the story of the four March sisters: pretty Meg, tomboy Jo, dear Beth and little lady Amy and not forgetting ‘our boy’ Laurie. My favourite March is Jo she’s so funny, energetic, and caring and maybe because I know how being a tomboy feels and are constantly being told that it isn’t proper for young ladies be running, jumping and talking slang. I love how she plays mother over Beth. 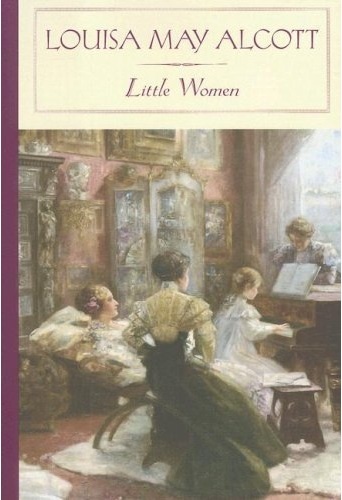 Each of the girls had little problems of their own that needed fixing for instance, Jo tended to be more like a young man not caring for a that fussing young ladies always seem up to, Meg was tired of her ministrations as a governess and wanted so badly to be rich someday to bask in the comforts like the more fortunate girls. Amy was so sick and tired of her own flat nose but distracts herself with her art, while sweet Beth was content with life and wanted to help mother with the chores and prays for father’s return from the war. While reading through we see their slips and their falls as well as witnessing them growing up. We see how they cope with their own personal changes and the ones that affects them all. Being one of four sisters myself I can relate to some of what they’ve experienced. I get to thinking about me as a separate person and how all what’s going on affects me, I examined my relationship with my sisters and saw what I can to to be someone they can look up to and turn to in times of trouble. Ms. Alcott gave me an opportunity to be a better person, a better daughter and a better sister. It’s amazing how books have the ability to influence us, the ability to change us for the better and, even perhaps, for the worst, but influences us nonetheless. Mrs.March teaches her girls and – us too – that we shouldn’t love for money and looks, we shouldn’t change ourselves to suit the world. Their ‘experiments’ only prove the dear old lady right for she’s had experience but the girls prefer to learn the hard way and more often than not it’s more effective that way there is. We see that the poorest of souls are the happiest because they have each other and such happiness cannot be given by money (even though it’s always welcome) and other worldly materials. We are reminded that every life is touched with sadness as well as joy. In the end they might not have gotten everything they’ve wanted but something much, much more that; being each other, their own families, warm homes and love to last for eternity.